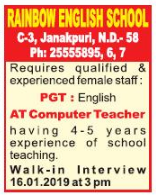 Rainbow English School, New Delhi has advertised in THE HINDUSTAN TIMES newspaper for recruitment of Teachers PGT / AT jobs vacancies. Interested and eligible job aspirants are requested to walk-in on 16th January 2019. Check out further more details below. About School: The trustees of Diwan Chand Memorial Education Society are greatly indebted to their Father Late Shri Diwan Chand Ji for being the source of inspiration and motivation of this noble and sacred cause of Education. As the results of his blessing and the pioneers’ sincere dedication and hard work, the school was founded on 3rd December , 1982. This year marked the beginning of an institution par excellence and thus laid the foundation of the Rainbow English Sr. Sec. School. How to Apply: Interested and eligible candidates are requested to walk-in for an interview along with CV, originals & copies of certificates, testimonials and recent Passport Size photograph to the walk-in address mentioned below.